Frostburg State University health science graduate Logan Cheshire captured the winning image in the recent BioArt Scientific Image & Video Competition – a contest designed to celebrate the art of life sciences – with a striking electron microscope image he made in the course of his research on mealybugs. Cheshire captured the winning image, one of 15 in the national Federation of American Societies for Experimental Biology (FASEB) competition, in his Advanced Microscopy class with assistant professor of Biology Dr. Rebekah Taylor, making use of the Carl DelSignore Foundation, Inc., Microscopy Suite. Taylor and Cheshire share the award. “It was really cool to see my name, along with Frostburg State, among the names of other winners from such prestigious schools and institutions,” said Cheshire, who graduated from Frostburg in May 2017. 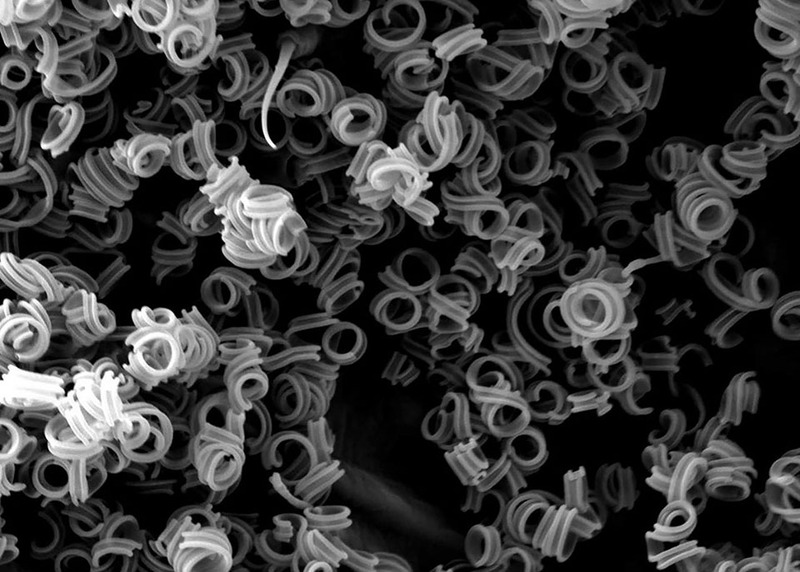 Cheshire’s winning picture, captured with Frostburg’s scanning electron microscope, found natural beauty in an unlikely place: the protective coating of “Pseudococcus affinis,” a common mealybug. To the naked eye, the insect’s waxy powder is unremarkable, but 1,800X magnification revealed the beauty. Cheshire attributed his success in part to luck. He collected unremarkable specimens of immature mealybugs, which have no waxy coating. As the semester progressed and the mealybugs matured, they began secreting their coating. Taylor expected that Cheshire would see random “chunks” of wax on the mature bugs’ surfaces. Yet when Cheshire looked closer with a standard light microscope, he realized the coating might be more interesting. Then he prepared his samples for a real close-up. That is one of Taylor’s aims in Advanced Microscopy. Cheshire, for one, was inspired to pursue a science-related career. The BioArt Competition was created to “share the beauty and breadth of biological research with the public by celebrating the art of science.” Taylor is a member of the American Association of Immunologists, one of FASEB’s constituent societies. BioArt winners were selected by a panel of scientists and engineers. The entries were evaluated for aesthetic impact and scientific content. Each year’s winning entries are displayed at the National Institutes of Health in Washington, D.C. All of the BioArt-winning images can be viewed at www.faseb.org. For more information about the health science major at FSU, visit www.frostburg.edu/academics/majorminors/bachelor/health-science-program-frostburg-state-university.php. 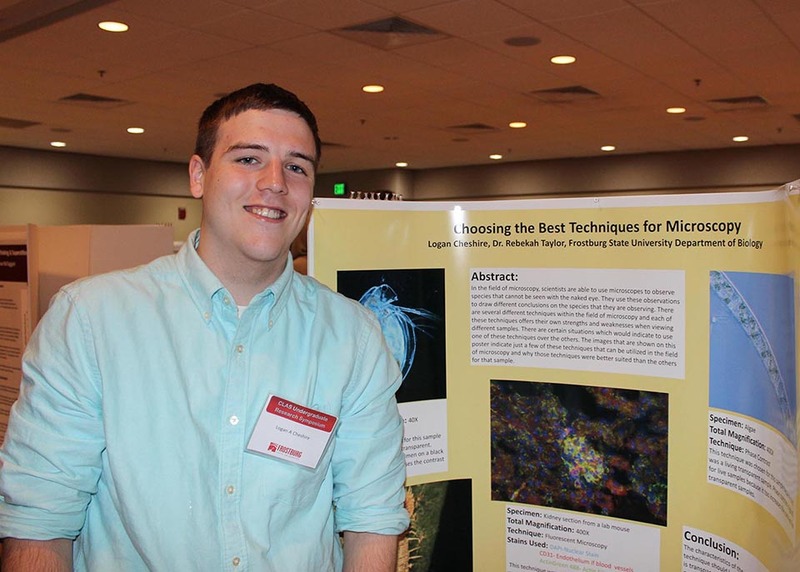 Logan Cheshire made a presentation on microscopy techniques at FSU’s 2017 Undergraduate Research Symposium. An image from a scanning electron microscope showing the nature of the waxy coating on a mealybug.